Last year, because the HHHA2005 awards were so spontaneous and because I was going to be away for the month of December, I didn't have time to get a piggy bank trophy made by someone. I ended up buying a large pink plastic one in a children's toy store. The fact that last year's trophy was a large, pink, plastic pig geared towards children didn't make the HHHA2005 any less of an award. In fact, it made it more of an award. To begin with, it made us laugh during the simple outdoor awards ceremony and it has subsequently made other people laugh and feel relaxed enough to feed it willingly. Who says a trophy has to be a stiff metallic thing that sits on a shelf doing nothing but gathering dust? 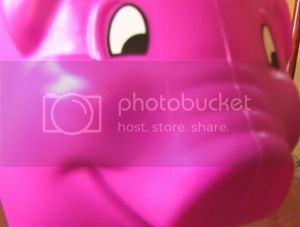 The pink piggy bank has been actively collecting money for W.O.R.C. since being awarded. Remember: don't judge a piggy bank by its cover. It's what's inside that counts. 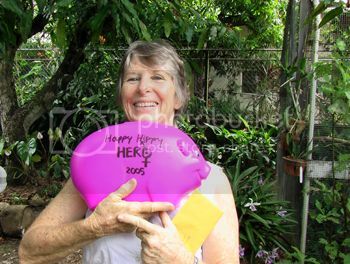 This year I was looking for someone whom I could commission to make a clay pig with HAPPY HIPPY HERO 2006 etched on its side. I asked Detta Buch, last year's HHHA recipient, if she knew of someone I could approach. She said: "There are quite a few people who could do it. I could do it ..." I immediately took her up on that offer. In addition to being a wildlife rescue/rehabilitation angel, Detta is also an artist, with clay being one of her specialties. So, this year's piggy bank will be made by the first ever recipient of the HHHA! How significant is that? She says she'll make a wildlife pig: a quenk.